In cities with less than 5% public transportation, a typical working family ($20-50,000 income per year) spends $10,300 on transportation. In cities averaging 12% public transportation that cost drops to $9,300; fewer car payments, insurance, gas and parking results in an extra $1,000 per year of disposable income. It is practical to privately finance a 20% displacement of oil-based transportation in the next three to six years, increasing a working family's disposable income by $2,000. In 10-12 years, it is possible to cut transportation cost by $5,000 by displacing 70% of oil-based transport; about a $5,000 increase in disposable income. Construction, manufacturing and operations jobs will be created. Driving Parasitic Mass, the mass we pay to move that is not cargo or passengers, towards zero results in dramatic cost reductions. Driving Parasitic Mass towards zero decreases the mass, cost and complexity of the capital infrastructure. Ultra-light infrastructure can be deployed more quickly and with less ecological and economic impact on the community. Energy use is affected by many factors. The very consistent rolling nature of rails greatly decreases the cost to keep railed vehicles rolling. Maintenance increases as a 4th power of axle weight. 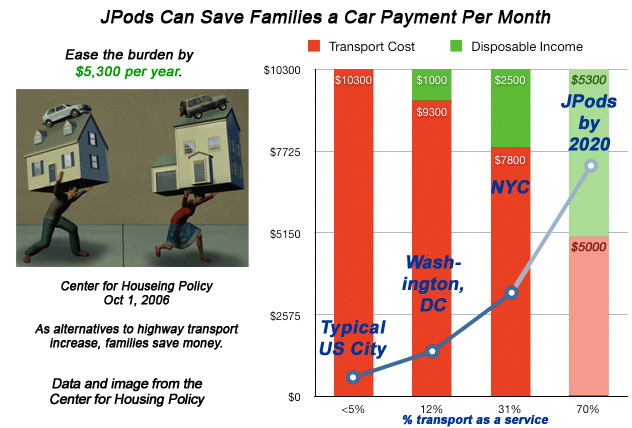 Using lighter vehicles, such as JPods, can greatly deacrease the cost associated with maintaining our transportation infrastructure.